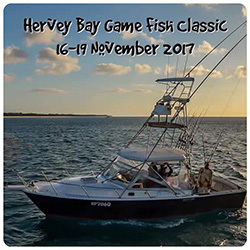 We’re keeping our fishing tournaments flowing with lots of interest as we look forward to the Hervey Bay Fishing Classic in November 2017. For more information please call Brad on 0431 611 196. It looks like its going to be a top season. Wishing all our visiting Boats Good fishing and tight lines! Unfortunately this tournament was cancelled due to bad weather. Fishing at the moment is great the Blacks have not left. 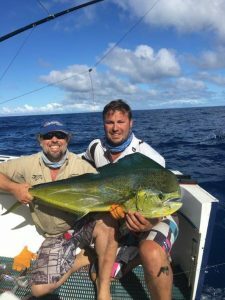 Boats from up the coast and down the coast have been here for weeks catching Black Marlin on light gear, and heavy Tackle the Blue Marlin are here smashing our lures. Some visiting boat have not gone home, we are lucky that the Marlin have been biting all year.It looks like its going to be a top season. Interest in this Year’s Classic was at an all time high with the prospect of having up to 35 Boats Register for this Unique Fishing Experience. At Registration the Total was 28 for varying reasons, with a sigh of relief for the Venues and the Mother Ships. There has been so much written and circulated World Wide on this unique location that the Organising Committee has so much to contend with, when it comes to operating a Tournament so far offshore in this pristine untouched location. After trials with various categories, it was decided to give the “Insiders” a separate entity and 7 Boats happily agreed to it and they even had their own Calcutta and Prize list. The 28 Teams consisted of 90 Anglers with 46 Crew looking after the Fishing Stations. This included 2 Lady Anglers and 2 Young Men Anglers. After a very interesting Briefing also represented by VMR 466 Hervey Bay Representatives, who gave an experienced and Informative talk on Radio requirements and procedures for leaving and returning to Port, it was time to leave for the area. Rooneys Point was the gathering point for all Boats and location of Mother Ships and where the Refuelling Barge would make but one visit after Day2 Fishing. After settling down in ideal condition after a great Meal and a few more handshakes, many were delighted to see Billfish and Tuna still chasing Baitfish in the glow of their Boats lights… but it was early to Bed for that early morning start for those crossing the bar and for the Insiders to get around their pattern. Day 1:-Start Fishing for all produced early strikes, Hook ups and Tagged Fish and the Radio was rarely silent. First Day Scores were great and most stayed on 8kg Tackle to see where everything was located and how best to put it together. Day 2:-Showed a very brisk Bite and this was very understandable in view of the Forecast for wind increasing and a Strong Wind Warning for during late afternoon and storms in the area. There were those that looked at their Score and went for Heavy Tackle with varying Points for each Line Class. Success for going Heavy Tackle paid off on the Blue and Striped Marlin, remembering that “Old Salty Dog” Tagged and Released what is considered to be a ‘Grander’ Blue Marlin the week before. By 10.00; 24 of the Teams had Scored! After Fishing, all Boats decided to stay in the Shelter from the increasing winds at Rooneys Point and check out the conditions in the Morning. However the weather Deteriorated even more, long before daylight and some Boats were forced to re-anchor in the very early hours of Sunday Morning. Day 3:-Showed abating weather conditions by daylight for the time being at least and after another great Breakfast, the last 5 hours of the Tournament unfolded with a division in Boats crossing the Bar and others staying inside. Those that continued with their own Strategies were rewarded and the Teams were extremely satisfied with their own performances. Stop Fishing was called at 12.00 on Sunday and All Boats headed for Urangan Boat Harbour in sight of very unsavoury weather conditions ahead for their return. ‘Mistress’ attended a call from ‘Black Magic’ for assistance out in the Bay and both had about 70 meters of visibility during the approach to the Boat Harbour, by the time they got there. The Storm raged for some time with regular Lightning strikes to un-nerve anyone caught out in it and then they were home and the last of the paperwork was received to do the ultimate check on Tag Cards, Paperwork and Scores that Pauline does so well. The Final Statistics are not that accurate because of the ‘pack attacks’ of small Black Marlin however the Numbers of Hook ups are a little more accurate and the number of Fish either Tagged and Released or Boated are accurate. Very Accurate from the Tagging and Boating. Day 1:- 40 Black Marlin; 1 sailfish; 14 Dolphin Fish Tagged and 1 weighing 9.6kg on 8kg; 9 Mac Tuna; 2 Mackerel, narrow barred; 1 Tuna longtail; 1 Wahoo. Day 2:- 33 Black Marlin; 9 Blue Marlin; 2 Striped marlin; 2 Sailfish; 26 Dolphin Fish; 2 Mac Tuna; 1 Cobia weighed. Day 3:- 18 Black Marlin; 2 Dolphin Fish; 1 Cobia. 365 Strikes, 275 Hook ups, 164 Fish – consisting of; 91 Black Marlin, 3 Sailfish, 9 Blue Marlin, 2 Striped Marlin, 43 Dolphin Fish, 11 Mac Tuna, 1 Tuna longtail, 1 wahoo, 2 Mackerel narrow barred, 1 Cobia. The Committee put in a lot of research and deserve your sincere thanks for a well thought out programme in detail of Tournament Rules and Hospitality. A very big thanks to Captain Lloyd and the Crew on Tasman Venture; fabulous Hosts and minders of the Teams and crew. Harveys on the Bay was a great venue with great Food and friendly service; SIMRAD through Hervey Bay Marine Electrical as the Anchor Sponsors and all supporting Sponsors deserve your continued Support! 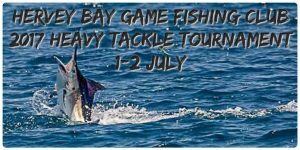 Interest in this years tournament was at an all time high with the prospect of having up to 35 boats register for this unique fishing experience. There has been so much written and circulated world wide about this unique location ( Hervey Bay Waters) that the Organising Committee had so much to contend with. When it comes to operating a tournament so far offshore in this pristine untouched location. After trials with various categories, it was decided to give the insiders a separate entity and all boats agreed to it and they even had their own Calcutta and prize list. Day 3- 18 Black Marlin 2 Dolphin 1 Cobia. Hello Brad, this is my wrap up for the Game Fishing Classic over the weekend and we thank you for every courtesy extended to Pauline and I and we cannot thank you enough for the overwhelming Friendship extended to us. 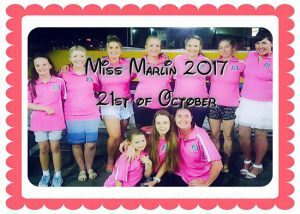 We really enjoy the Hervey Bay Tournament and will continue to talk it up at every level and on as many occasions as presents itself. Everyone in the Club welcomes Teams from near and far and this is a very solid base to build on when encouraging Teams to make the trek. While there were more larger Craft than rcent times, there is still room for smaller vessels crew on the Mothership as well. We look forward to doing everything we can for the future and please advise us if there is other avenues you would like pursued. To you Brad, Sandy, David and KJ – our thanks and from everyone else who all enjoyed the Tournament. The co-operation from all the Teams was really overwhelming and all promised to return. HERVEY BAY GAME FISHING CLUB ‘s CLASSIC 14th 17th NOVEMBER, 2013. 18 Teams with 64 Anglers including 2 Lady Anglers and 2 Junior Young Man Anglers , set forth from the Hervey Bay Boat Marina on Thursday after a Great Briefing in HARVEYS Bar & Bistro, to the sheltered anchorage off Rooneys Point on Frazer Island where the Mother Ship TASMAN VENTURE laid anchor and set up as the Tournament Base for all Fishing operations which finished at 12 noon on Sunday after 2 1/2 days of excellent fishing in the pristine waters around the Great Sea Spit. Anglers came to the Ship for a cocktail or two as the sun slipped down over the Horizon and soon it was quiet as they rested for the first day of Fishing early next morning. By the end of Day One, after 3 almost identical Radio Skeds, there were 22 Black Marlin on 8kg ,1 Blue Marlin on 37kg and 2 Sailfish on 8kg. Talk that night was of the many pulled hooks where the small Black Marlin did not get the hook in the right place to stay hooked. Those out after the Blue Marlin saw some that were not that interested in going for a workout. No late nights on the Mothership again and all were out early again as the Bar was practically cross-able at any point and all Boats fished “Outside ” on both Light and Heavy Tackle. Fishing was slow in the morning but picked up with the Tide by lunch and another very respectable score was achieved by stop fishing at 1600. 21 Black Marlin on 8kg, 3 Blue Marlin on 37 and 60kg with more Dolphin Fish recorded. A lively time at dusk on the Mothership relayed great stories and early to bed also as it was only 1/2 day on Sunday and there were many contenders for the places to fill after the 12 noon Stop Fishing. So Far all but one Boat had Scored and there was lots of room both ways for categories to be filled. At daybreak the Breeze had arrived as forecast and the surface lost its reflective glaze. The Boats headed out early and the Fishing was brisk with reflections of last year at times. Unfortunately some Boats suffered the worst mechanical problems forcing them to limp back inside and start their slow way Home, fishing as they came. Nothing was serious and others that had faired not as well, took off and made up for it. 2 Boats got all their Billfish fish on the last day. The wrap for day 3 showed that for only a half day, there were 15 Black Marlin on 8kg and 2 more Sailfish on 8kg. One Black Marlin was called in at only .800mm and it was decided not to tag it ; just gently release it after a ‘fin sample’ ..fin samples were also taken from other specimens for very important research. There was also a ” Tag Return “; that is a Black Marlin that had been tagged previously was caught ; the Tag streamer was removed and the Fish Retagged and Released. These sort of occurrences always make a Tournament more interesting and meaningful. There were 58 Black Marlin ; 4 Blue Marlin ; 5 Sailfish all Tagged and Released. A Total of 203 Strikes : 149 Hookups : 77 Recorded Fish of which ; There were Dolphin Fish T&R as well as 3 Specimens Weighed and I wahooweighed. 2 Cobia were boated along with other non-qualifying Fish. A very respectable Result to a well concepted Tournament with 3 sections available for “Salt Water Fly Fishing ” with its own points system, or stay “Inside” and fish for additional Species and varied points. Everyone chose to fish ” outside ” in perfect conditions. We should also thank VMR 466 Hervey Bay and VMR488 Bunderberg for their assisstance and co-operation extended to everyone. Copyright 2012 - 2018 HBGFC.org.au - Hervey Bay Game Fishing Club. All Rights Reserved .